Audi will allow customers to place a $1,000 refundable deposit to order the company’s E-Tron electric SUV when it is unveiled in September, a tried-and-true strategy for cashing in early on electric car hype. First deliveries of the E-Tron, which will debut on September 17 in San Francisco, should start in early 2019. That’s a more typical debut-to-release timeline than the last car to make headlines with a $1,000 deposit program, Tesla’s Model 3. The E-Tron crossover will be the first of three all-electric models Audi plans to launch by 2020. 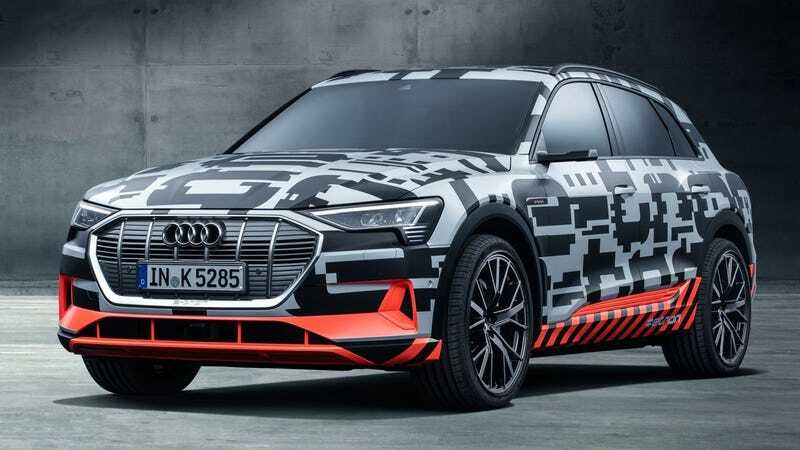 At least one of those is likely to be similar to the E-Tron GT that the company teased in March, while the E-Tron Sportback we saw in April could round out the range. Audi’s also using a new online portal for the owners to track their E-Tron as it’s built, so impatient owners-to-be can watch their baby luxury electric SUV as it comes together. The so-called “digital ecosystem” will be further detailed at the event in September, but I’d expect it to have a lot more to it than purely reservation tracking. Mack Hogan was Jalopnik’s bumbling summer intern. Despite being a self-proclaimed car critic, he bought a baby blue Lincoln with a landau top. You probably shouldn't listen to him.